There are 24 posts filed in outsourcing (this is page 2 of 12). And I will not work for less than NUBSLI fees guidance. With information like this leak, it is about time ALL interpreters learnt how to negotiate the lies told to us by disreputable agencies and toughened up a bit. If you are not sure how to do this and you need support, there is strength in numbers, NUBSLI is the place to go. Court and police work should demand the best interpreters in the country and pay accordingly. What a sad, sorry state of affairs that this contract is. We all knew that five years ago when it started, let’s not allow this situation to continue. It isn’t just sign language interpreters who have had the wool pulled over their eyes, the situation for spoken language interpreters has been far worse. It is time to stop it. As reported on the Limping Chicken blog earlier in the week, over 1000 signatories signed the open letter to Francis Maude MP, asking him to #ScrapTheFramework. The letter included Len McCluskey, General Secretary of Unite the Union, leading campaign organisations and several MPs. You can read the letter on NUBSLI’s campaign page. 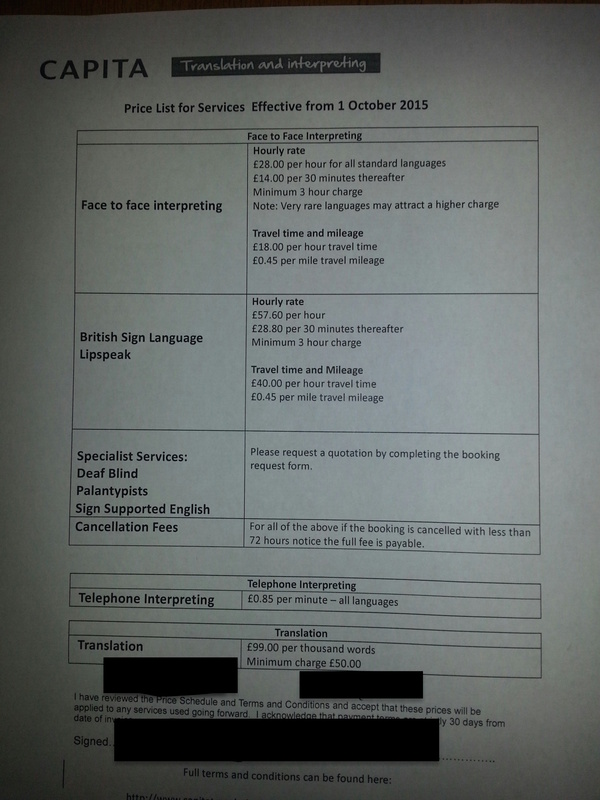 This framework will change the way interpreting services are delivered to Deaf people in the UK, as well as covering all spoken language interpreting and other communication support such as lip speakers, deafblind interpreters, note takers and speech to text reporters. Privatisation of a whole sector in one go. There is still work to be done in making representations to the Crown Commercial Service as there is a proposed two-hour minimum for interpreters and no travel expenses. Aside from terms and conditions and fees the actual framework needs much more work. There are no stipulations about where Trainee Sign Language Interpreters (TSLIs) are able to work leaving agencies able to put Trainees into child protection and mental health. The NRCPD’s view. As long as registration is stipulated that is fine. It is not. Registered is RSLI: Registered Sign Language Interpreter. TSLI is on the register but not registered. Confused? So is everyone else. Trainees have yet to reach the National Occupational Standards and as such need to be protected and Deaf people safeguarded appropriately. NRCPD states on their website that Trainees should not work in legal settings and mental health. NRCPD, do what you say and tell the CCS no Trainees in mental health. Child protection should be explicitly stated too. As an unwritten rule the interpreting community has recognised this area as a no go for Trainees for years due to its legal as well as it’s moral nature. On the spoken language interpreting side, there are low level qualifications stated for all areas, leaving the quality of provision dangerously low. Given that most agencies are motivated by profit the lowest possible common denominator gets the job not who is the most suitable. Private contracts are hardly safe when monitoring is left in the hands of private agencies who can make up their own figures (cf Ministry of Justice framework and ALS now Capita TI). The way Deaf people are talked about is patronising and erroneous. “Non-spoken”, interpreters enable Deaf people “to access hearing” and if you are Deafblind you have access to video relay services. Hardly written from the basis of good knowledge and practice, or even common sense. No. This framework is a disaster waiting to happen.